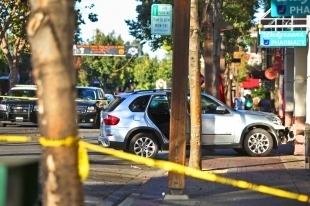 This fall, 90-year-old Edward Nelson lost control of his vehicle, jumped the curb, and pinned two six-year-old twins against a wall with his BMW SUV in Menlo Park, California. One of the twin brothers suffered a broken arm. The other was hospitalized in critical condition; he wasn’t released from the hospital until five weeks and multiple surgeries later. A third brother, 9 years old, was also injured in the collision. Perhaps you would expect Nelson to be ashamed? Beg the family for forgiveness? Not so much. In response to a lawsuit from the family, Nelson’s attorney has accused the boys of “reckless, careless and negligent” behavior. According to The Almanac, the family is seeking damages from Nelson, a retired attorney, for the injuries and emotional trauma the boys suffered. Some of the injuries may be permanent, they say. Nelson’s attorney claims the boys, “knowing the probable consequences thereof, placed themselves in a position of danger.” And that the family failed to “reasonably mitigate” damages they sustained. Meanwhile, The Almanac reports, Nelson’s license was confiscated after the crash and he was ordered to undergo an examination with the DMV. The Almanac reports that he only faces “a possible infraction” from local law enforcement since he was not intoxicated and his license was valid. Walking on the sidewalk is putting oneself in a position of danger? Wow. Perhaps putting yourself behind the wheel of an SUV at the age of 90 is the real position of danger. What else is the sidewalk for but for walking on? It’s perfectly reasonable to walk on the sidewalk and not expect some moron to drive up onto it and hit someone. We don’t let anyone under the age of 16 drive, but there’s no upper age limit. After a certain age, reflexes and eyesight begin to diminish and the driver becomes a menace. Lawmakers ought to consider a law requiring not only an eye exam, but also a driving test when a person reaches the age of 80, and require the tests be repeated every two years. After age 85, it should be an annual test. And at age 90, a doctor’s certificate ought to be required certifying that the person is fit to drive a car. This is not age discrimination. The FAA won’t let commercial pilots fly after 60, why are we letting people older than that drive without medical certification and frequent retesting of ability? It’s just standard legal language in this situation. His lawyer would be remiss if he didn’t say those kinds if things. I suppose one could say that parents are reckless, careless, and negligent if they let their kids walk on sidewalks as long as the general public holds drivers to such low standards. After all, what’s wrong with jumping the curb with your BMW? Can’t these damn kids run fast enough to get out of the way? Sure, I suspect Mr. Nelson’s attorney is blowing smoke and attacking with a “up yours” defense. Let’s see what a jury thinks. I say that with some trepidation, though. Police and local reporters rushed to blame a 14-year-old girl who was struck by a speeding driver in a marked crosswalk.